When your vehicle is involved in accident in Tyrone, PA, or the surrounding region, you are presented with a big decision. Where do you take your car, truck, SUV, or minivan to repair the dents, bangs, scratches, and bumps? Even the smallest repairs seem huge when it comes to the hassle and cost of auto body repair. Your best move is to have your vehicle taken to McClellan’s Body Shop for repair. At McClellan’s, our fast, friendly service will get your vehicle back on the road and looking like new. Give us a call at (814) 684-1130, or stop by the shop at 1231 Walnut Street in Tipton when your car gets banged up. McClellan’s Body Shop has been family owned and run since we opened in Tipton, PA, in 1975. We are here when you need us with the services and assistance to help ease your worries when it comes to repairing whatever is wrong with your car in Blair, Centre, and Huntingdon counties. 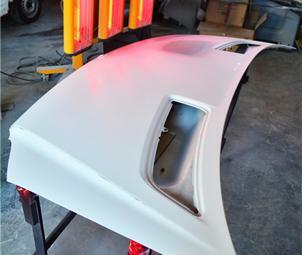 Our professional auto body repair technicians can perform everything from complete auto body repair to paint matching. From working with your insurance company and getting you a rental car to making sure the paint matches just right, you can count on McClellan’s Body Shop for expert and courteous care for your vehicle. We have been doing auto body repairs for drivers in Tyrone, Altoona, Huntingdon, State College, and beyond for over 43 years. We like to think our experience and products we use give us a competitive edge over other auto body shops in the area. We are here when you need us, so contact us today.